Do You Worship a “Pagan” Trinity? Do You Believe in War, Hell and the Cross? Does Your Bible Remove God’s Name? Do You Preach Jehovah’s Kingdom? IF JESUS WAS THE FIRST TO ASCEND TO HEAVEN, WILL ELIJAH AND OTHER OLD TESTAMENT BELIEVERS BE IN HEAVEN? The Watchtower Society teaches that only 144,000 people will live eternally in heaven while the rest of faithful mankind will only have the prospect of living forever in “Paradise” earth. Believing that this 144,000 heavenly group began at Pentecost (33 AD), Jehovah’s Witnesses claim that “there is nothing in the Scriptures to show that a heavenly hope was held out to God’s servants prior to the coming of Christ Jesus.”1. Thus, they assert that “David, Job and John the Baptizer” as well as “all faithful men and women who died before Jesus died.…will be resurrected to become some of the earthly subjects of God’s kingdom.”2. In support of their belief that none of the Old Testament servants of God will be in heaven, Jehovah’s Witnesses reference John 3:13, Acts 2:34 and Matthew 11:11.
.:ARE JEHOVAH’S WITNESSES ALLOWED TO STUDY THE BIBLE BY ITSELF? JEHOVAH’S WITNESSES ARE SPYING AND STALKING US! What Can We Do? “I dated a Jehovah’s Witness for a while and got her pregnant. I have broken off the relationship, but she continues to manipulate me by threatening that she won’t let me see the child if I seek custody.
.:HOW CAN I FORGIVE MY JEHOVAH’S WITNESS FATHER WHO ABUSED ME AND THE ELDERS WHO DID NOTHING ABOUT IT? The Resurrection of Jesus Christ - A Spirit or a Body?
. :IS THE JEHOVAH'S WITNESS BIBLE, THE NEW WORLD TRANSLATION, A GOOD TRANSLATION? It is a well-known fact that the Watchtower Bible and Tract Society religion of Jehovah’s Witnesses denies the Deity of Jesus Christ. To this end, when they produced their own translation of the Bible (The New World Translation of the Holy Scriptures), they went to great lengths to make it appear that the Scriptures do not support the idea that Jesus Christ is God (Jehovah). In an attempt to shift the emphasis off of Jesus Christ as God, they inserted the derivation “Jehovah” (an adaptation from the original Hebrew “YHWH” for God’s Name) in place of theos (God) and Kurios (Lord) in multiple verses in the Christian Greek Scriptures (New Testament). Thus, they created a distinction between Jehovah God and Jesus Christ that is not warranted in the text. In addition to inserting God’s Name where it is not supported by the text, they have also mistranslated many verses that support the Deity of Jesus Christ to justify their own anti-Trinitarian dogma. The following list (prepared by Chris Stire of Life After Watchtower Support Ministries) provides a record of the verses where the Watchtower Society’s anti-Trinitarian bias can be seen in their New World Translation. We encourage readers to verify these errors with any Greek/English Interlinear, including the Kingdom Interlinear Translation of the Greek Scriptures published by the Watchtower Society. NOTE: All references to brackets in the list below are from the 1984 edition of the New World Translation because in 2006, the Watchtower Society updated their version of the New World Translation Bible to remove the brackets that they used to have around words that they inserted that are not found in the Greek text. Thus, all editions of the New World Translation except the ones between 1984 and 2006 have words deceptively added without the brackets to make it seem as if these words are found in the original Greek text even though they are not in the text. Will the "Great Crowd" be on Earth when Armageddon breaks out? For years, Jehovah’s Witnesses have taught that the vast majority of their followers will resurrect to everlasting life upon an Earthly Paradise and that only a select group of 144,000 followers will live and reign with Jesus Christ in Heaven. These two groups of followers are called “the Earthly Class” and “the Heavenly Class.” The “Earthly Class” is also called “the Other Sheep” of John 10:16 and “the Great Crowd” of Revelation 7:9, while the “Heavenly Class” is called “the Little Flock” of Luke 12:32, “the Anointed Class” of 2 Corinthians 1:21-22 and “the 144,000” of Revelation chapters 7 and 14. These terms are used frequently to reinforce this two-class structure of the Watchtower belief system. - Reference Chart exposing the doctrinal errors of the Watchtower Society in parallel form by comparing Watchtower doctrine against the clear teachings of the Bible. HELL - Why Believe in it? Jehovah's Witnesses, Mormons and other religious groups deny the idea that a literal "hell" exists in which all who reject Jesus Christ will be eternally tormented with fire. They question how a "loving God" could send people to such a place with no hope of an end to the torment. In answer, we must examine what the Bible teaches in regard to "hell," God's love, justice and the sinfulness of man. WAR and NEUTRALITY - Should Christians Remain Neutral during War? Jehovah's Witnesses believe that it is the Christian's duty to remain "neutral" during warfare. In countries throughout the world, many have faced imprisonment and even death for their conscientious objection to bearing arms in war. "Notice that there is no command in the Scriptures against military service. Obedience to a draft would remind us of our Lord's words, 'If any man compel thee to go a mile, go with him twain.' The government may compel marching or drilling, but cannot compel you to kill the foe. You need not be a good marksman. Question. You suggested in a recent WATCH TOWER that, if drafted and in the army, we need not shoot to kill. Would such a course be right? Would it not be fraudulent? Answer. No; it would be quite right to shoot, not to kill. You forget, perhaps, our provisos, which were that we explain our conscientious scruples against war, and seek to be excused; if not excused, that we seek non-combatant positions, as nurses, etc; but if compelled to go a mile or many miles as a soldier, we still need not kill anybody." ARE HEBREW SCRIPTURE PATRIARCHS IN HEAVEN? - Did Elijah send a letter to King Jehoram after his ascension into heaven? - 2 CHRONICLES 21:12: "then a letter came to him from Elijah the prophet...."
Jehovah's Witnesses teach that no person who lived prior to the coming of Jesus Christ went to heaven. In order to support their ideology, they explain Elijah's ascension into heaven as a temporary removal from one place on earth to another and claim that Elijah reappeared on earth to send a letter to King Jehoram (2 Chronicles 21:12), years after he went up to heaven in a whirlwind (2 Kings 2:11).1. There is no indication that Elijah went up to heaven before he sent the letter to King Jehoram of Judah. We read at 1 Kings 22:50 and 2 Kings 1:17 that Jehoram became King of Judah two years before a different King Jehoram became king of Israel. It wasn't until the NEXT chapter at 2 Kings 2:11 (during the reign of this other King Jehoram of Israel) that we read of Elijah's ascension into heaven. DO JEHOVAH’S WITNESSES SHUN FAMILY MEMBERS WHO LEAVE? 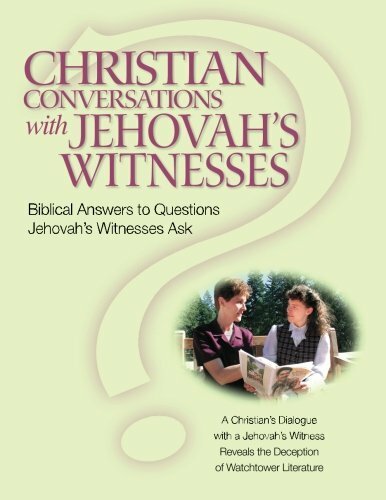 — Does the Bible Support the Jehovah’s Witness practice of shunning? 2. IS THE “TRINITY” DOCTRINE FROM PAGANISM?